While I was working through the cocido leftovers last week, I made an Andalusian classic, montadito de pringá, a sandwich made with the cooked meats and fat from the cocido mashed to a kind of pâté. That inspired a week’s worth of montaditos! 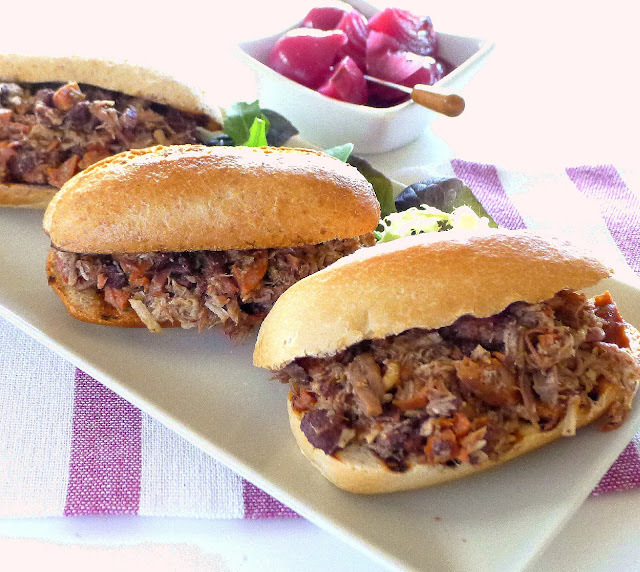 A classic--montaditos de pringá--cooked meat from the cocido, mashed with pork fat--on toasted rolls. 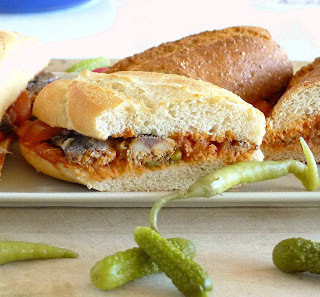 Montadito means “mounted,” or “up in the saddle.” A slice of juicy, fried pork loin, “mounted” on bread and topped with strips of red piquillo pepper, is a classic montadito. You can heap just about anything on a bread roll and call it a montadito—for example, Russian salad, fried fish, sautéed mushrooms or leftover cocido. So, go ahead, invent some montadito combos for yourself. A montadito isn’t your ordinary sandwich, something slapped between two slices of sandwich bread. The bread—a fresh, crusty roll—is as important as the filling. 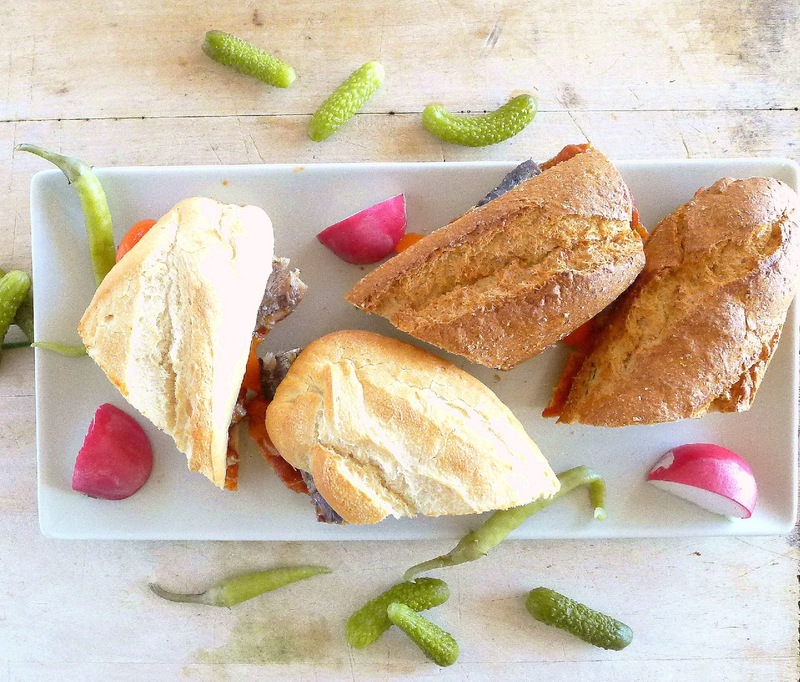 Montaditos are served in cafeterias for “elevenses,” segundo desayuno, second breakfast, eaten mid-morning. 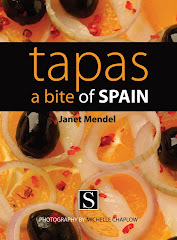 They’re a favorite tapa bar selection and, of course, they make an ideal lunch. Sometimes the bread is toasted or grilled. Some montaditos are served cold, some hot. 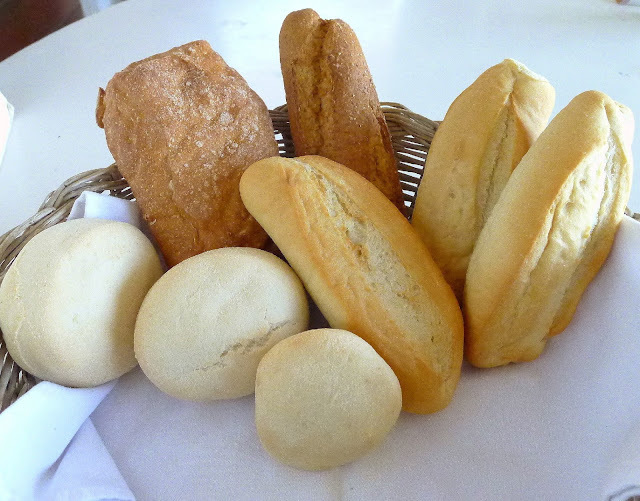 On the left, molletes, smooth buns; above them is a chapata, a small ciabatta; next, a whole-wheat barra, or "bar" loaf; the other three are bollos, crusty rolls, each one makes an individual sandwich. 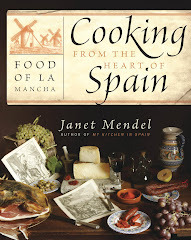 Usual breads for montaditos are bollo, a crusty roll; barra or baguette, a long, crusty loaf that, once filled, is cut into shorter lengths; mollete, a soft, flat bap of a bun, somewhere between a pita and hamburger bun (but, unlike hamburger buns, with no sugar); chapata, from “ciabatta,” with air pockets in the spongy crumb, and pan de país, country bread baked in round loaves and thickly sliced. 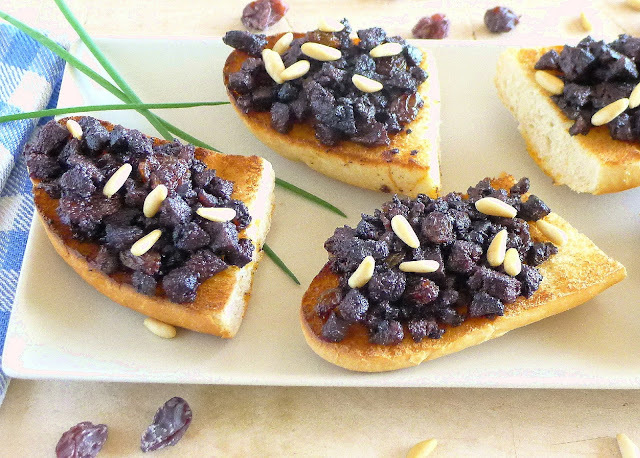 Blood sausage, raisins and pine nuts, heaped on toasts. 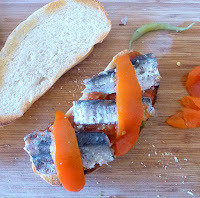 Spread rolls with a spicy tomato sauce, add sardines and strips of piquillo pepper. Pepito--a steak sandwich, with a tangy mushroom sauce. 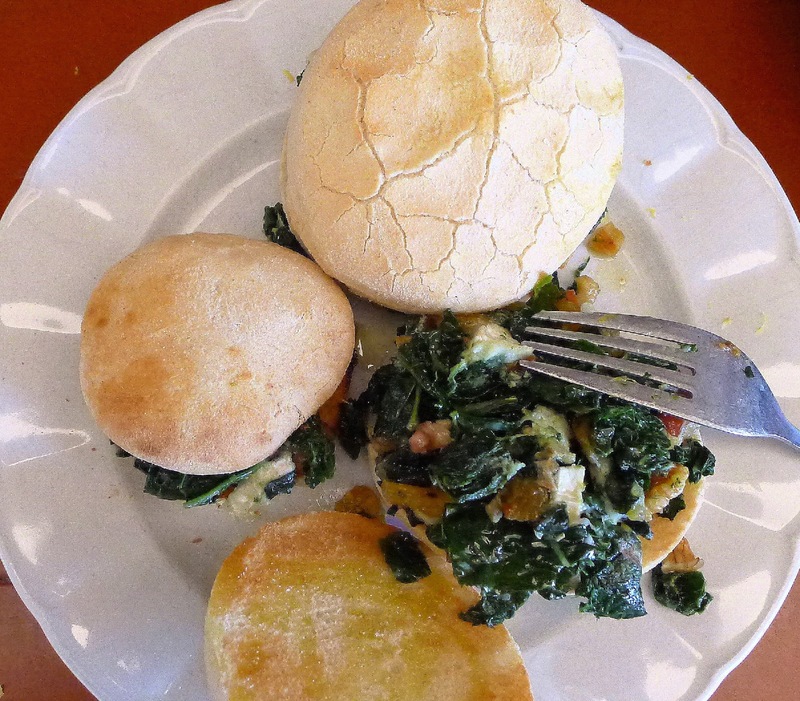 Kale with walnuts and cheese, stuffed in a bun called mollete. The meat mixture probably needs no added salt or other seasoning. Use crusty rolls or soft molletes, which are like buns. Split the rolls and toast them. 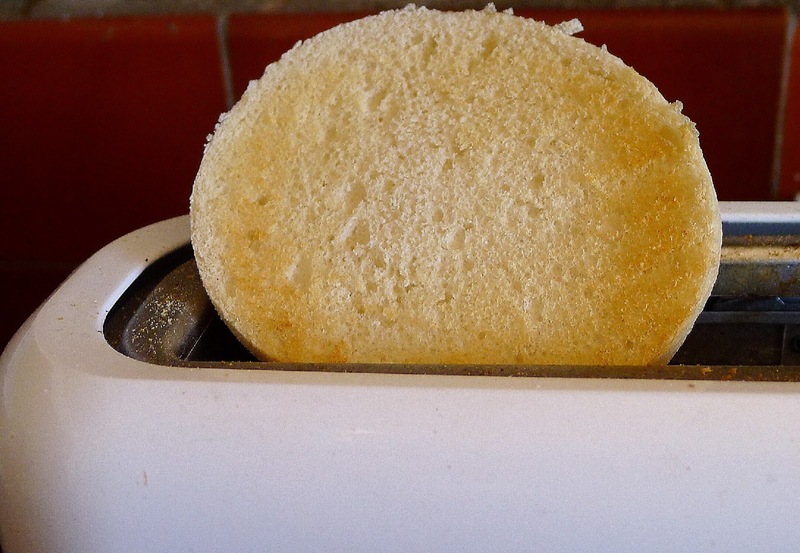 Spread the pringá on the rolls and press the top half down so the bread absorbs the juices. The montaditos can be prepared in advance. Spread the pringá in the rolls, wrap them in foil. When ready to serve, heat them on a griddle or in the oven. 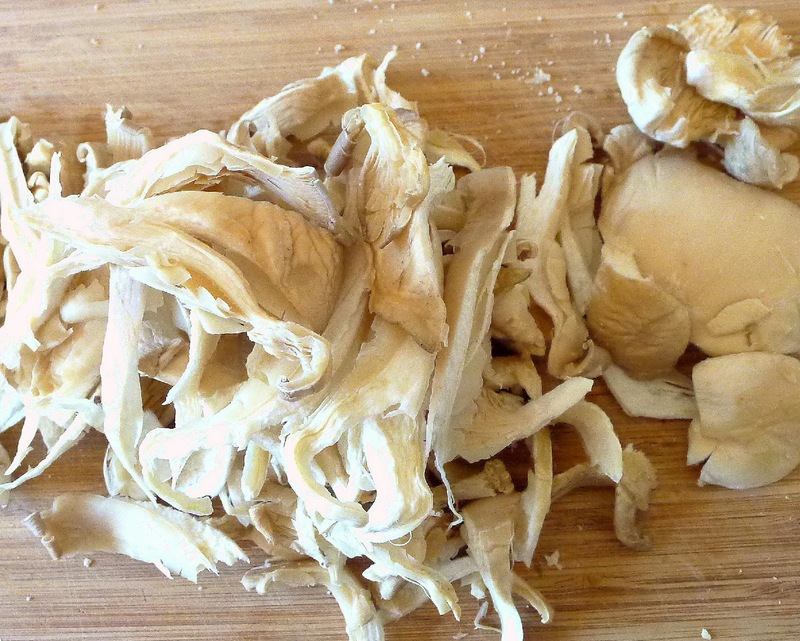 Heat the chopped and shredded meat and fat with the broth in a skillet. Mash the fat to make a sort of paste. Heap the hot pringá on the toasted rolls. 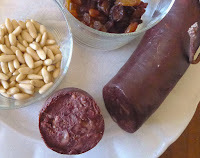 Sweet raisins and crunchy pine nuts contrast with rich and spicy blood sausage (also called black pudding or budin noir). Málaga muscatel raisins are the best, but they have to be seeded. Or use any seedless raisin. 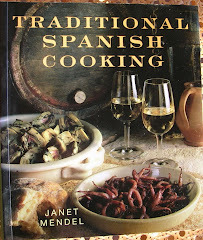 Use either morcilla de Burgos with rice or morcilla de cebolla, with onion. Use bollos, crusty rolls, or thickly-sliced country bread. These montaditos are served open-faced. Blood sausage, raisins and pine nuts. Heat the oil in a frying pan and fry the pine nuts until they are golden, about 30 seconds. Tilt the pan so the oil flows to one side and skim out the pine nuts. Remove the skin from the sausage and chop it into small pieces. Add to the frying pan with the raisins and sauté on medium heat, breaking up the sausage pieces, 2 minutes. 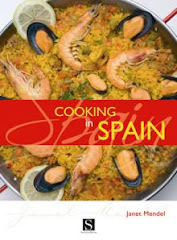 Add the wine and cook until sausage begins to sizzle again, 4 minutes. If using crusty rolls, split them open and cut each half in half crosswise. Toast under a broiler/grill. Divide the sausage mixture between the toasts, pressing it down. Sprinkle toasted pine nuts on top. Serve hot or room temperature. In the bars in the old quarter of Zaragoza, this tapa is known as a “guardia civil.” Pimentón picante, spicy-hot paprika, gives the sauce its fire power. If you haven’t got this sort of pimentón, use cayenne, but in a lesser amount. Piquillo peppers, sweet and piquant, come canned and ready to use. They are worth a search, but, if not available, use any red pimiento. Chopped pickles go into the spicy tomato sauce spread on these sandwiches. 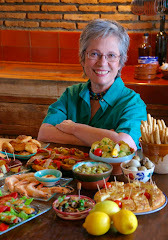 Combine the tomato sauce in a small bowl with the vinegar, pimentón, onion, chopped pickles and chile, if using. Spread a spoonful on the bottom half of each roll. Strips of peppers on the sardines. Lift the sardines out of the cans, discarding the oil. Carefully split them open lengthwise. (The bones can be removed, if desired, but they are perfectly edible.) Place 3 half-sardines on each bread roll. Top with half a piquillo pepper or strips of pimiento and cover with top of roll. Serve at room temperature. 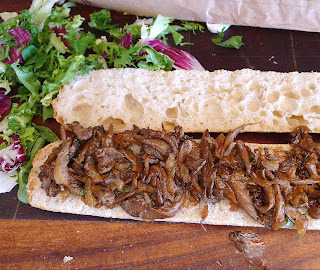 Pepito--a steak sandwich, here with piquant mushroom condiment. 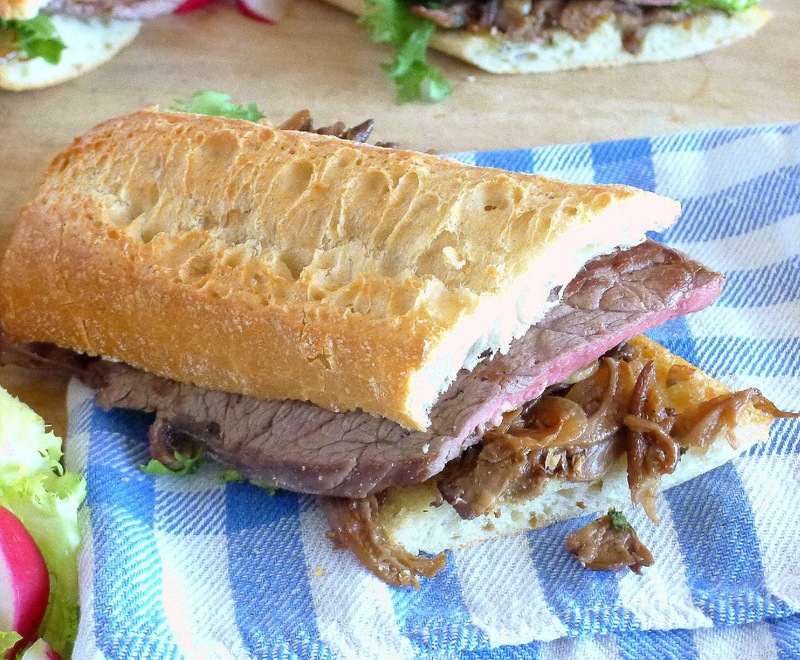 At its most basic, this is just quickly griddled beef on a bread roll. 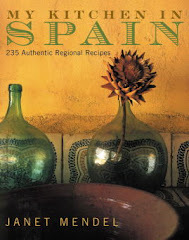 Sometimes it has fried green Padrón peppers or cheese or mushrooms or a fried egg. 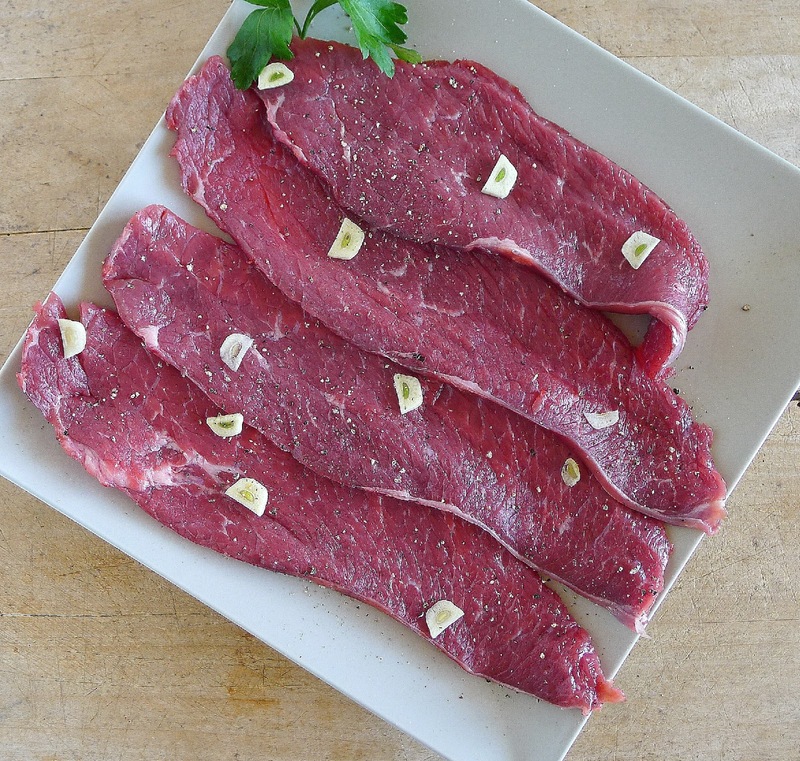 Use thin “frying steak,” cut about ½-inch thick, for this sandwich—rump steak is fine, though thinly- cut strip steak or butterflied tenderloin is even better. Pan-grill the meat (use a cast-iron skillet or plancha, an unridged grill pan), about 1 minute per side, so it is still pink in the center. PX Sherry vinegar gives the sauce a slightly sweet tang. If not available, use balsamic. 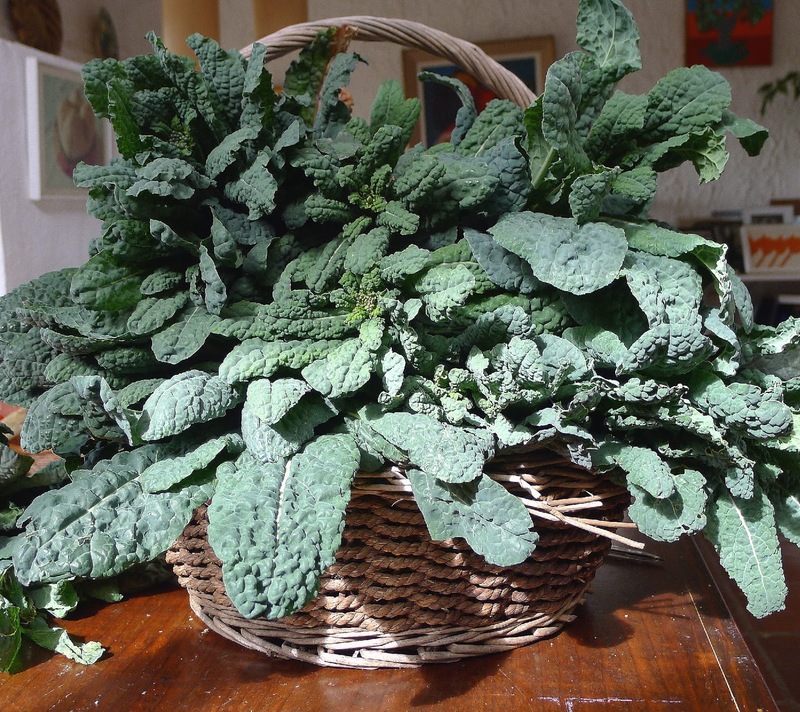 Rucola or other greens to serve. 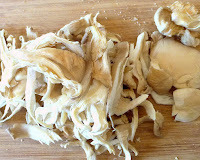 Tear or slice the mushrooms into strips. Heat 2 tablespoons of the oil in a skillet and sauté the mushrooms on moderately high heat until they begin to brown and crisp at the edges, 6 to 8 minutes. Scoop them out and reserve. Cut onion in half and thinly slice crosswise. Add remaining 1 tablespoon of oil to the pan and sauté the onions until they are very browned, about 8 minutes. Season with ½ teaspoon salt, pepper and a pinch of thyme. Add the vinegar and water or stock. Season the steaks with pepper and sliced garlic. Allow to come to room temperature. Heat a plancha or heavy skillet very hot. Sprinkle it with coarse salt. Pan-grill the steaks until browned on both sides, about 1 minute per side. Remove. Spread mushrooms on baguette, top with steak. Split the rolls or the baguette. Spread the mushroom sauce on the bottom halves. Top with the steak and a few leaves of rucola. 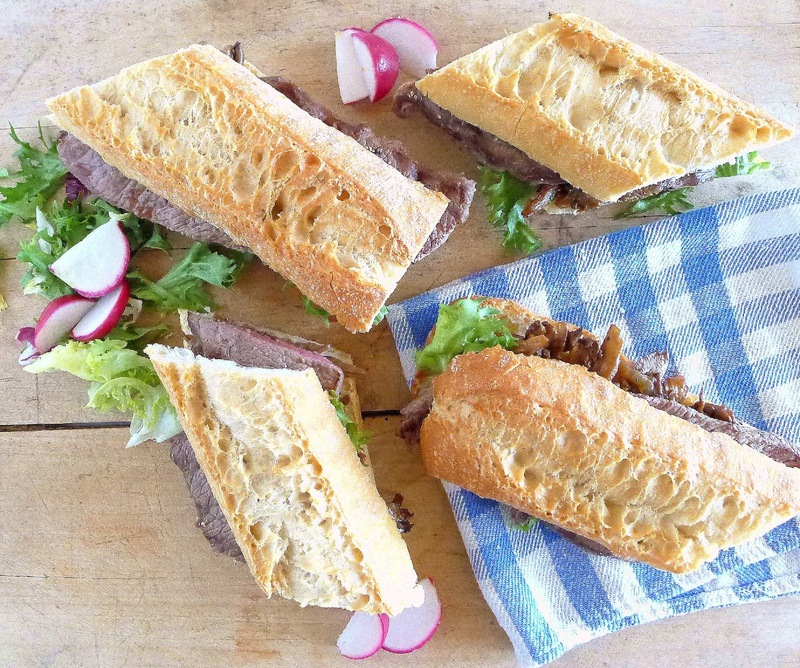 If using a baguette, slice the sandwich into four sections to serve. 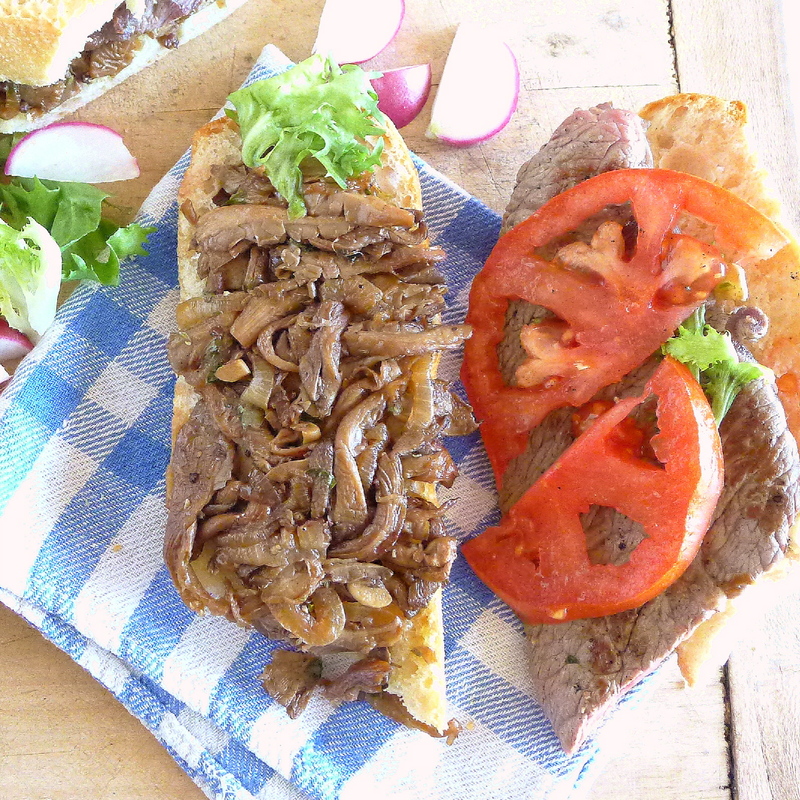 Add sliced tomatoes to the steak sandwich. Pile sauteed kale on toasted buns. 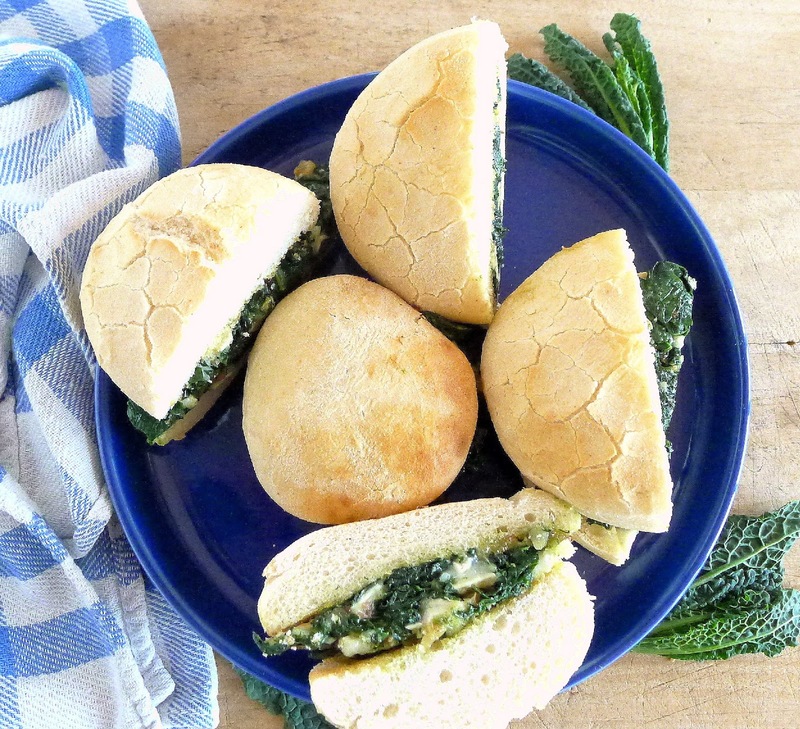 Taking my own advice—"invent some montadito combos for yourself"—I turned garden kale into these sandwiches with chopped walnuts, dried apricots and goat cheese, packed into molletes, buns. For a vegetarian sandwich, omit the optional bacon. 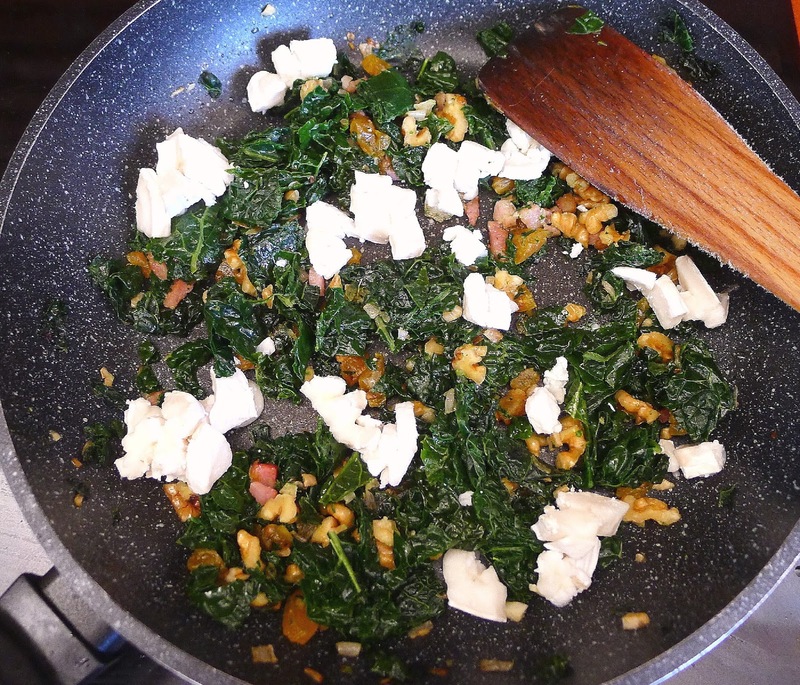 Add goat cheese to hot kale. Heat the oil in a small skillet with the bacon, if using. Add the garlic and shallot and sauté them gently until softened, 5 minutes. Add the kale, apricots and walnuts. Season with salt and pepper. Cook, stirring, until the kale is bubbling. Add a little water if needed. Add the goat cheese to the hot kale. Stir to combine and allow the cheese to soften. Remove from heat. Spread the kale on the split and toasted buns. Serve warm or room temperature. Garden kale--inspiration for a montadito sandwich. Pottage with kale and beans.